Our vacation home is an apartment for 2-6 persons. It consists of 1 double with bad and 1 small room with 2 beds and a separate double bedroom with shower is available down stairs in the house. The rooms are comfortably equipped to make your stay very pleasant. We are located in the village of Werlau on top of the hills above the Rhine valley. Close by is the ancient Castle Rheinfels and the famous Loreley on the Rhine river. Great quality apartment. Comfortable in a good location. What really makes the difference is how thoughtfully it is equipped - makes the stay very comfortable and more like stopping in someone’s home than a holiday let. Thoroughly recommend. The apartment was spacious, spotlessly clean and very well equipped. The property is situated in a quiet location on the edge of the village with pretty views of the countryside from the balcony and plenty of outside space if you had children. The living accommodation is particularly good with a lovely spacious and well equipped kitchen and an enormous sitting/ dining room. One en-suite double bedroom was downstairs on the ground floor which suited our teenage son very well. The property is very much as advertised and we were very impressed. There was plenty to do in the area and we were happily occupied for a week and could have stayed longer. There are many charming towns to visit and a Rhein Cruise was a relaxing way of seeing the river and countryside. We would have no hesitation in recommending the apartment; a really super place to stay if you want to visit this part of the Rhein. Ursula our hostess was friendly and welcoming and we thoroughly enjoyed our visit. My wife and I spent five nights at Ursula's apartment in Sankt Goar. The apartment is beautiful, well-maintained, and in great shape. The apartment has plenty of space. 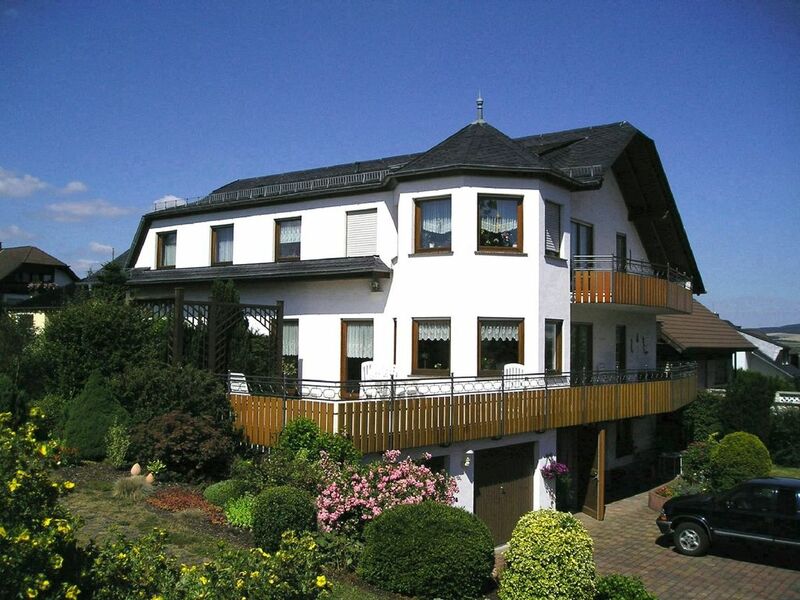 The location is perfect for an extended stay in the middle Rhine area. We would definitely stay again. This is one of the best apartments we have ever stayed in. The accomodations were absolutely perfect. The apartment was so large that it was almost like being in a whole house. We highly recommend the apartment for anyone visiting the Rhine area. The apartment is located just above Burg Rheinfels and it was great to drive down to the Rhine each day and see the old fortress. We had the greatest hostess, so accomodating to all our needs. Wonderful apartment,very nice people ! We had a very nice holiday in this area.The apartment is very clean, well equiped and very spacious.Ursula and her husband are very nice and helpful people.The surroundings are wonderful and we had a lot to visit.Hope to come back again! Die Ferienwohnung ist sehr gut, sehr sauber und sehr ansprechend ausgestattet. Sie bietet sehr viel Platz für jeglichen Reiseklumpatsch und um sich richtig gemütlich auszubreiten. Durch das im Keller liegende DZ mit eigenem Bad kommt es auch in der Waschstraße nicht zu Engpässen, was der Laune aller Reisebeteiligten sehr zugute kommt. Die äußerst großzügige Terasse und der schöne Garten nebst den guten Parkmöglichkeiten lässt auch Kindern genügend Freiraum für Bewegung in sicherem Umfeld. Das Örtchen Werlau bietet leider keine Einkaufsmöglichkeiten, da muss man schon etwas weiter fahren um sich entsprechend mit Lebensmitteln einzudecken, aber so geht es auch allen Anwohnern dort im Rheintal, also ein allgemeines topographisches Platzptoblem der Gegend :). Etwas seltsam war nur, dass die Unterkunft schon 3 Wochen im Vorfeld komplett bezahlt werden musste und das gab dann einen Stern Abzug. Das liegt aber an der Organisation von fewo-ditekt :(( Die Wohnung empfehlen wir in jedem Fall weiter! Vielen Dank an die Vermieterin. Mit freundlichen Grüßen. Only 3 km from St. Goar lies the village Werlau. There is a heated open-air swimming pool at the entrance to the village. Directions to the vacation home: A 61 Koblenz - Mainz, exit Emmelshausen, afterwards towards St.Goar. At the beginning of Werlau turn left on the first street (Holzfelder Str.) afterwards turn left into the next street. Preis gilt für 2 Personen pro Nacht.